Are you ready to face the fear again? 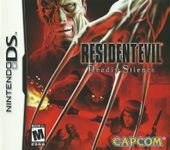 This time it’s bloodier, scarier, and close enough to touch... Resident Evil Deadly Silence for the Nintendo DS. The Police are reporting strange disturbances in Raccoon City. Nearby, Chris Redfield and Jill Valentine, two S.T.A.R.S. agents, approach a deserted mansion looking for their missing colleagues. Little do the agents know the terrors they will face inside… little do they know that in their desperate search they have stumbled on the birthplace of horror. * Resident Evil reborn – The complete original Resident Evil and Resident Evil: Rebirth Mode, with new puzzles, more action and new horrors to uncover. * Spread the fear – Play new wireless co-operative and versus multi-player modes with up to four players. * Close enough to touch – Use the unique DS touch-screen to slash zombies with your knife and solve new puzzles.